This region, which derived its name from the thermal springs, was part of the British Empire for nearly 300 years and was annexed by France in 1453. Politically divided into five regions, Aquitaine is home to two world-famous cities, Bordeaux (the capital), renowned for delicious wine and Biarritz, a well-known surfing destination. Ancient chateaux like Chateau de Biron, cathedrals like Bordeaux Cathedral and museums like Musee d’Aquitaine are among the famous landmarks located amidst chic Aquitaine houses. 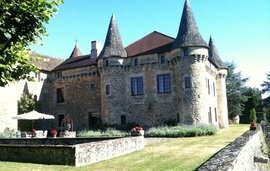 Hot Aquitaine properties snapped up by international buyers include Aquitaine gites (holiday homes), Aquitaine villas, Aquitaine houses, Aquitaine apartments and Aquitaine manors. If you are looking for a country property, check out the idyllic stone cottages, stunning Aquitaine villas and impressive wineries for sale near Saint Emilion, a charming cobbled-stone village in Gironde. Bordeaux, with its 18th century buildings, landscaped parks and world-renowned vineyards has impressive investment properties such as medieval Aquitaine chateaux and prestigious Aquitaine mansions. For elegant Aquitaine apartments and character-filled Aquitaine manors, visit Belves, an attractive town in Dordogne, known for its 14th century castle and cave dwellings. Residents of these high-end Aquitaine properties can enjoy a peaceful lifestyle that includes attending theatre and concert performances, surfing, golfing, gourmet dining and watching Music festivals. Year-round Grape Picking festivals add to this region’s charm. Let us assist you in finding your perfect villa, apartment, holiday home or investment property in Aquitaine, France. For more details, call us on + 44 (0) 207 870 7181 or contact our estate agents in France. With four international airports, over 50 domestic airports, excellent road and rail routes and waterways connecting Aquitaine to other French cities and Europe’s major cities, residents of the sought after Aquitaine properties can benefit from an easy commute. Located close to the ocean and blessed with a great climate; Aquitaine is a surfer’s paradise. Affordable property prices attract UK second home buyers and international buyers looking for an excellent choice of investment properties. The variety of cultural and leisure pursuits ensure that residents of Aquitaine properties will entertained as little or as often as they wish, with great opportunities to meet other residents with mutual interests. Winkworth France has a comprehensive portfolio of quality Aquitaine properties and would be happy to help you buy or rent an Aquitaine property. Contact us for your requirements.